Otherwise known as huckleberry, billberry was used in World War II to enhance the vision of British pilots flying at night. Bilberry contains strong antioxidants that, in addition to supporting vision, also sustain the circulatory system. 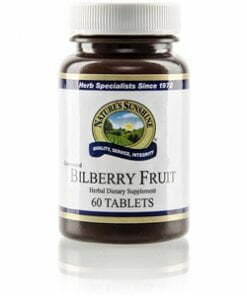 Each 40 mg Nature’s Sunshine Bilberry Fruit Concentrate tablet contains 25 percent anthocyanins, a key antioxidant. 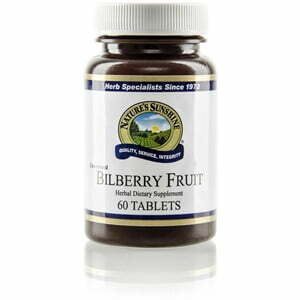 Regular use of Bilberry Fruit Concentrate allows the body to fully take advantage of bilberry’s nutritional benefits. Instructions: Take two tablets with a meal three times daily. Cellulose (plant fiber), stearic acid (vegetable), magnesium stearate (vegetable), and silicon dioxide (powdered silica).